In my opinion, June is the most lovely month of the year. The days are long, the weather is generally warm but not uncomfortably hot, and I can spend the entire month grilling my dinner and never tire of it. June is also Dairy Month! 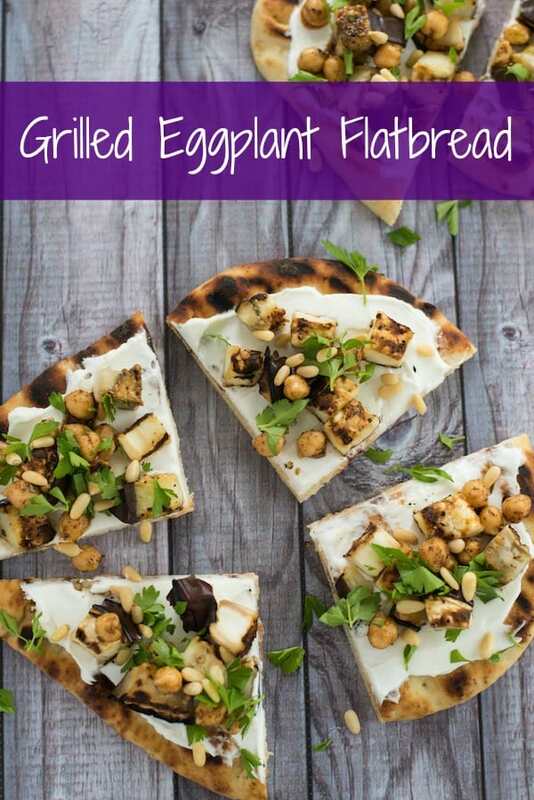 I couldn’t think of a better way to celebrate the fresh, wholesome milk produced on dairy farms across Michigan than with this Grilled Eggplant Flatbread made with a generous helping of creamy Greek yogurt. This vegetarian meal comes together fast, so you can eat you dinner in a hurry and get right back to your outdoor activities. This is also a great dish for a potluck or backyard party! First, make some quick spiced chickpeas by tossing canned chickpeas with olive oil, cumin, oregano, cinnamon and chili powder. Then, it’s time to head out to the grill! Put slices of eggplant onto the grates and cook 6 to 8 minutes or until they have great grill marks and are nice and tender. Throw some naan bread on right near the end, and get some grill marks on that, too. Bring everything inside and assemble: spread yogurt over the naan bread, making sure you get yogurt in all the nooks and crannies. 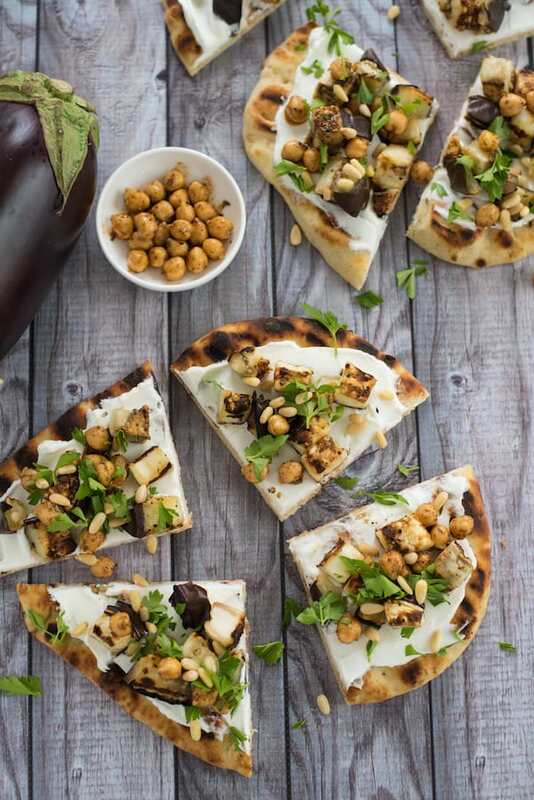 Chop the eggplant and arrange that over the yogurt, then pile on the spiced chickpeas, along with a sprinkle of pine nuts and parsley. Cut into wedges and enjoy! 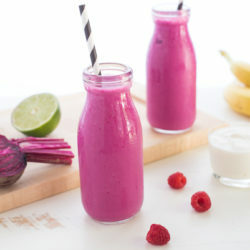 The yogurt used in this recipe was produced by members of the United Dairy Industry of Michigan. For more information on UDIM and to find out why Milk Means More, please visit their website and connect with them on Facebook, Pinterest, Instagram, YouTube and Twitter. Preheat grill for direct grilling over medium-high heat. In small bowl, toss chickpeas, oil, oregano, chili powder, cumin and cinnamon until well combined. Sprinkle eggplant slices with salt and pepper. Transfer eggplant to grill and cook 6 to 8 minutes or until grill-marked and tender, turning and flipping occasionally. Place naan bread on grill during last minute of eggplant cook time; cook 1 minute or until light grill marks develop. Transfer eggplant to cutting board and chop into 1-inch pieces. Spread yogurt over naan bread. Top with eggplant and chickpeas. Sprinkle with parsley and pine nuts, then cut each naan into quarters. Serve immediately. Hooray for Dairy Month! I agree – June is my favorite month of the year. The weather is great and I’m not dreading the summer coming to a close yet! This flatbread is so perfect – I love this idea and can’t wait to try! Right? June is clearly the best month! Thanks for stopping by, Ashley! I love this so much! We just had slow cooker eggplant with beef and cinnamon. Such a great combo! I’v never heard of slow cooker eggplant before. Do you have a recipe for that, Liz? 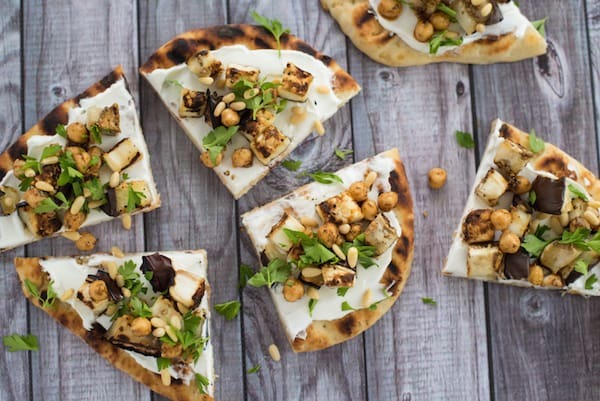 I love the idea of naan as pizza crust. This sounds great! I LITERALLY just (like yesterday) discovered how delicious grilled eggplant is! 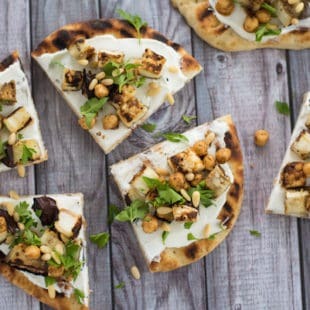 But, I never thought to flatbread it up! 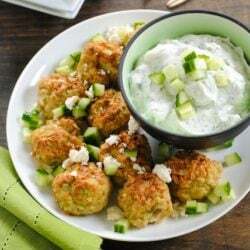 I love that you used some Greek yogurt for protein and extra creaminess…loving this appetizer! Pinned! Oh good, I’m so glad you’re part of the grilled eggplant club, Taylor. It’s so good, right? Thanks so much Sue, I appreciate it! Naan is awesome. You can do so much with it and I love the grilled eggplant on top of it. 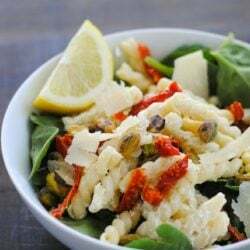 Perfect easy and light summer meal! I’m not a vegetarian, but I do love eating eggplant for meatless meals. I also love eating flatbread “pizzas” because I very rarely plan ahead in time to make pizza dough. Right? Homemade pizza dough is super tasty, but planning that far ahead for pizza isn’t always in the cards for me!